I’ve recently begun using VMware Workstation to test image deployments with MDT 2010 and immediately ran into an issue with the default NIC that VMware Workstation 7 uses. 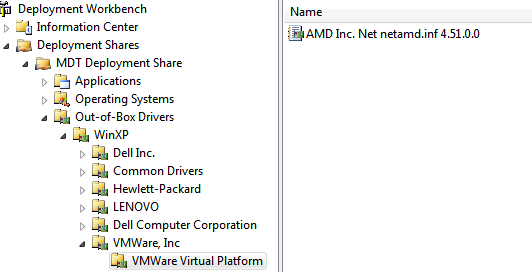 When you create a new VM and use the XP profile it defaults to using an emulated AMD PCNet NIC. If you choose a Windows Vista or 7 profile it defaults to using an emulated Intel e1000 NIC. None of my MDT LiteTouch images included the AMD driver so I had to go searching for it. I didn’t find the drivers on VMware’s site but I did find it on AMD’s site here. 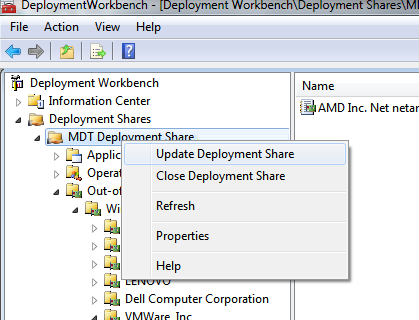 Once you download the extract the drivers open up your Deployment Workbench. Import them into your Out-of-Box drivers into the correct folder (You are using folders in MDT 2010 right?). Don’t forget to rebuild your Deployment Share to regenerate your WinPE images. Now just import the WinPE images into your PXE server or update your boot CD. You can now boot your LiteTouch image on a VMware Workstation 7 VM. Thanks for this info Admin now I can boot LiteTouch image on a VMware Workstation 7 VM. Thanks this was exactly what I needed – your blog also looks very handy for deployment tips! Keep up the good work. Thanks! Glad I could help out a fellow admin in need! assert it. You make it enjoyable and you still care for to stay it wise.